People gather at the federal courthouse in downtown Charleston to support a lawsuit to stop seismic air gun blasting on the coast. Congressman-elect Joe Cunningham ran on the issue during the midterm elections, promising he would not allow offshore drilling along our coast. He’s the first democrat the first congressional district has sent to Washington in 40 years. He’s also a former ocean engineer. The concern of course is the impact on marine life, like whales and dolphins that depend on sound. Cunningham says he’s already working on legislation to re-instate the ban on offshore drilling. It will be the first bill he introduces as a new member of Congress next year. 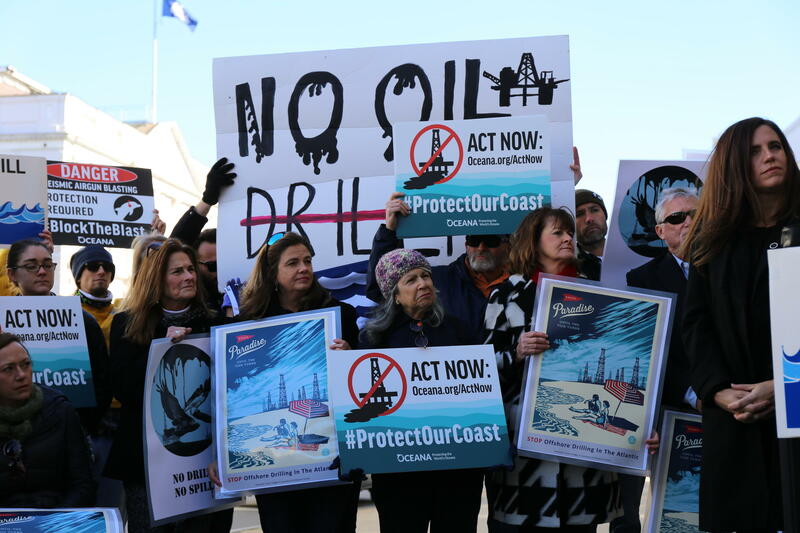 The crowd was made up of a who’s who of community and state leaders, both Democrats and Republicans, all vowing to fight any effort by the Trump administration to explore for oil and gas in an attempt to drill off the coast. The owner of Murrells Inlet Seafood spoke as well. He wanted to know why certain species of fish are protected by the government, yet the oil industry is allowed to kill. His 18 year-old daughter stood beside him. He says he worries about her future.